Fixed backup issue on 6.2L motors. Fixed speed simiter for 5.3L motors. Added support for old 6.2L motor calibration. Support for new updated calibrations for 2007 vehicles. Fix for support for VIN Engine Code = "0" 5.3L Motors. Fix for support of VIN Engine Codes = "Y" and "K" 6.0L Motors. All truck tunes redone for better WOT (Full Throttle) shifts and better fuel economy. Added support for 2007 6.0L "Y" and "K" Motors. Fuel adjustment ranges changed to adjust settings better around peak torque rpm. Fixed 2010 Camaro Adjustable Parameters for DoD/AFM disable and others. NOTE: Very early calibrations are not supported, update by GM dealer to "Current Software" might be required for some. GM Software update fixes numerous production bugs and is neccessary to ensure proper performance and tuning. To find out about the available PCM updates for your vehicle, please enter your VIN or CalID numbers at this website: GM Service Updates Database. This information will help you with getting the necessary GM dealer warranty update reflash if the Predator requests it. This is not neccessary to do unless the Diablo Predator refuses to install because of an old GM PCM calibration. Important Missing Calibration Information: The Predator was recently re-designed to identify and analyze your vehicle's computer for a supported operated system. There are many operating systems released by GM for their products within a given model year as well as new operating system updates performed by your local dealer under warranty service. If your vehicles's operating system is currently not supported then there is a procedure necessary for the Predator to be updated via the internet to support your vehicle's unique software calibration. You will need a power adapter and serial cable or USB-Serial Adapter. These are called PC Interface Kits. We offer both the U7777 Serial PC Interface Kit and U7778 USB PC Interface Kit. If the Predator states that your vehicle's operating system is not supported then the Predator will attempt to record a copy of it. This copy of your GM software will be able to be exported to your Windows PC (MAC supported only when running a Windows OS). After exporting the data, you can email it to DiabloSport tech support and they will decode it, test it, and publish a new Predator software revision that can be downloaded and installed into the Predator over the internet from your PC. All of the necessary software for the PC interface and software updates are free from DiabloSport. There is no deadline or scheduled timeline for Predator updates. Some updates take longer to develop and publish than others. It is important to understand this information prior to ordering as you may have to wait for a software update for the Predator to work on your vehicle. DiabloSport does not want their customers to have a $300+ paperweight but it must be understood that if GM never changed the computer software during and after production of a vehicle, then the inconvenience of these Predator updates would not be necessary. All terms and conditions apply to these sales, no exceptions. The Diablo Predator is a state-of-the art, high performance tuning flash programmer in a sleek handheld design. Once connected to the vehicle, the DiabloSport Predator's internal computer recognizes the vehicles PCM and automatically picks the proper tuning files designed specifically for that PCM. Inside the Diablo Predator's memory are the actual tuning files that optimize spark timing and air/fuel ratio curves. Unlike other 'tuners', DiabloSport's programming is performed in very small increments throughout the entire RPM range, for a smoother, wider and a more predictable power delivery. DiabloSport engineers spend many hours on the dyno, street and track to ensure the tunes provided with the Predator are the best they can be. The Diablo Sport Predator was created with one thing in mind, POWER! 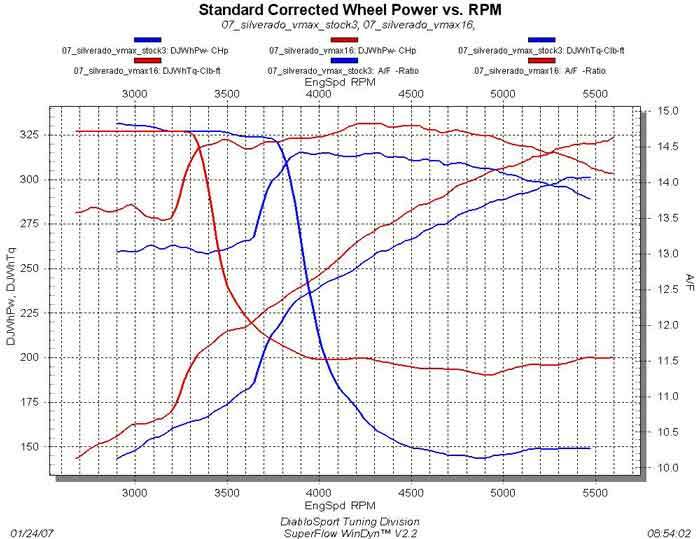 Average power gains are 10-20 RWHP for cars and 20-30 RWHP for Trucks/SUVs. 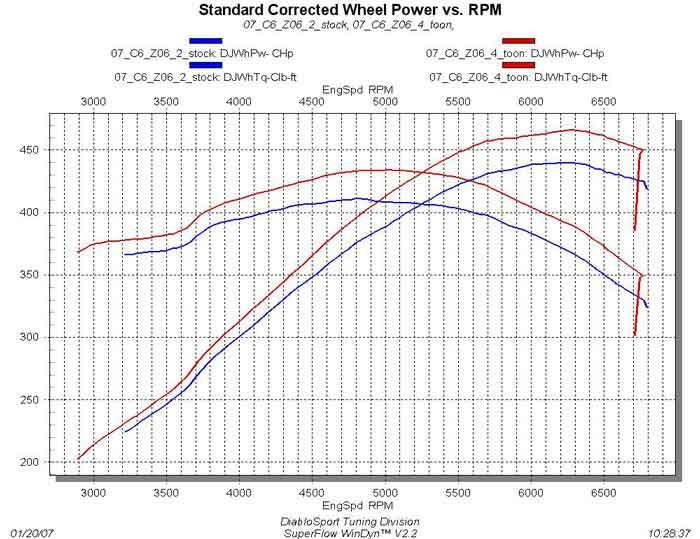 And 25 RWHP increase on Z06 Corvettes. The Diablo Predator's additional power makes itself noticeable immediately with an increase in power that starts in the low RPMs and builds into a frenzy at the high RPMs. A Predator equipped vehicle will notice significant improvements in drivability. The additional power created by the Predator tune will yield quicker acceleration and better mileage, whether it is in town or out on the highway. The Pre-done Performance tunes in the Diablo Predator are adequate for stock or slightly modified (street legal bolt-ons) vehicles. The Predator is also equipped with End-User Adjustable Parameters that will allow the end-user the ability to tailor the tunes to their needs. Or, the Diablo Predator can receive custom tuning created by a professional tuning facility either locally or receive it over the internet and install it into the Diablo Predator with the Optional PC Interface Kit.